The crest for House Croatan evokes the traditional heraldry of its founder. The powerful elemental wizard Virginia Dare was the first British child born in the new world, to parents Ananais and Eleanor Dare, themselves formidable wizards of British heritage. The crown symbolizes the sovereignty of Virginia Isle, the famous floating island populated mostly by Dare’s extended family, and its proud state of autonomy from the five provinces of the North American magical world. Virginia Isle mainly floats in the sky above the Atlantic and is protected by a wide variety of flying creatures: dragons, wyverns, manticores, and wisps. Typically the Isle migrates southerly to Solaris Province in the wintery months, and then north to Destiny as summer approaches. The rope shown on the crest both tethers and liberates, demonstrating the ties to tradition and the ability to cast off those bonds. Additionally it refers to Virginia Isle’s mutually beneficial relationship to many wizard communities, both on land and over water. The ship’s wheel or helm reflects the economic powerhouse of Virginia Isle, which serves as a mobile port-of-call for Magimundi mercantile sailing vessels. It also represents that one may steer one’s course through life, and that the actions one dares to take set the direction of one’s journey. Bold action is privileged by house members, as is reflected in the house motto: To dare is to do. In fulfillment of an ancient prophecy, Dare forged four arrowheads in the colors of the four directions. After placing the arrowheads in the shape of a Maltese Cross, Dare’s arcane power caused the cross to turn counter-clockwise, opening a portal into the earth. Like Hercules, Orpheus, Virgil, and Dante before her, Dare journeyed to the center of the earth. There she met a giant terrapin whose eight children supported the eight directions. 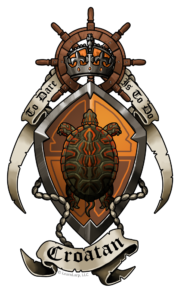 A ninth child, with a colorful painted shell in orange, brown, red, and yellow, chose to return to the surface with Dare, and is depicted upon the crest. Croatan house colors are brown and orange, the colors of the turtle, of autumn, and of camouflage. As a renowned cryptozoologist, Dare’s vast knowledge of hidden magical creatures of the air, earth, sea, and underworld helped her to create and defend Virginia Isle. She could summon creatures to her aid, and communicate in their own languages. Dare had such affinity for all living things that even the most hostile magical creatures would submit in her presence, and poisonous plants would not affect her. She delighted in demonstrating these powers by defiantly chewing arum berries, drinking nightshade draught from a goblet, or running barefoot across thorns and nettles without the slightest scratch. Virginia Dare was instrumental in the founding of New World Magischola in 1635 when her daughter Ophelia was refused admittance to Imperial Magischola of Massachusetts Bay. She provided the majority of the Leeuwendaalders necessary to fund the school’s construction and pay faculty salaries. The Samson family, directly related to Virginia Dare herself, remains the custodian of a generous endowment that almost single-handedly supports the continued funding of New World Magischola. House Croatan has come to be associated with Cryptozoology as the legacy of its founder. Additionally, it’s associated with wealth in Leeuwendaalders, and many students from families of unsoiled wizard heritage call House Croatan their home. Like Virginia Isle itself, House Croatan is a bit of an enigma to those outside of it, with carefully kept secrets and traditions. There is an air of exclusivity among house members, who consider their election to Croatan to be evidence of their power and influence among the Magimundi. Other houses are quick to remind Croatans that no wizard is an island unto itself.